With its strategic location atop a high ridge, Mdina has attracted settlers since the Bronze Age. The Phoenicians take the credit for erecting the first defensive walls in 1000 BC, with the Arabs strengthening the fortifications and adding a moat in the 9th century AD. In 1090, Roger the Norman, Count of Sicily, captured Malta, and Mdina became a Christian town. The Normans, French, and Spanish each ruled in succession. As a small aristocracy grew, so did the construction of palaces, monasteries, cathedrals, and churches. Mdina became the home of Malta’s oldest and most patrician families. One such family, the noble family of Moscati Parisio, built a grand palace—the Xara Palace—along Mdina’s massive walls during the late 17th century. During WWII, British officers of the RAF used the palace as a mess hall. A hotel has existed here since 1949. In 1996 the Zammit Tabona family bought the property, with the goal of creating a historically correct and luxurious hotel. For three years, using original drawings and plans from the Government archives, the Xara Palace was renovated to reflect its glorious 17th-century ambience. Here’s one more reason to stay at the Xara Palace: at the end of the day when the tourist buses have left, you’ll have the magical town of Mdina all to yourself. There are plenty of dining options around. Try a delicious pastry and tea at the Fontanella Tea Garden. On top of the city walls, the views over the countryside are superb. Mdina’s location in the center of Malta makes it a good base from which to explore the rest of Malta. The hotel can arrange any sightseeing options, or use your own transportation. It’s easy to get about. 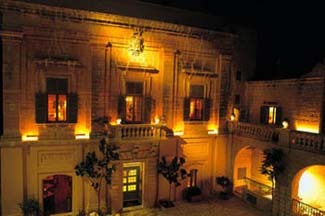 Mdina is about 10 km west of Valletta or 8 km from the International Airport. If driving, you must park outside in one of the big lots as cars are not allowed in the Old City. The hotel can provide transfer service. By public transportation, take bus #80 from Valletta or #65 from Sliema.The hotel is just inside the main gate. A short distance away from the beachside resorts and the cruise ship bustle, at the Xara Palace you can experience the sedate elegance of a Maltese noble residence. Enter the main gate of the charming historical town of Mdina, and you’ll spot the palace just ahead. Easily the most luxurious hotel on Malta, everywhere you look in the public rooms exquisite period pieces contribute to a gracious atmosphere. A gorgeous 18th-century wooden door, crafted by Italian sculptor Paulo Cellini, highlights one end of the lobby. An open-air atrium with a pair of 200-year-old olive trees makes an inviting place to relax. Each guestroom is completely different; some deluxe suites have private terraces, Jacuzzis, and wonderful views. Furnishings and fabrics in soft neutral tones are imported from France. All rooms feature selected antique pieces and original artwork. CD players supply a bit of musical ambience if you wish. Marble bathrooms are fully equipped with heated towel racks and amenities. The award winning “de Mondion” restaurant offers modern French and Mediterranean cuisine. Panoramic views stretch far in the distance. When the weather is warm, you may enjoy dining al fresco on the ramparts—especially romantic under a full moon. For lighter fare, try the Trattoria A.D. 1530, which is open for lunch and dinner.